Litchfield needs to choose: Safety for one, or justice for all? The choice to create a “bottle season” focused on the riot means critiquing the show can become a bit of a temporal trap. It feels like it’s been a long time since Daya shot Humps in the opening moments of the premiere, given that more than half the season has transpired, but in truth it’s been only a couple of days. I want to say that the show has struggled to make Daya’s story resonate in ways that justify the decision to have her be the one who picked up the gun, but for only a two-day period we’ve seen a reasonable post-traumatic response. Daya broke down emotionally early on, struggled to maintain her reputation with Gloria having stolen the gun, walked away from the riot to clear her head, and then worked through some of her unresolved feelings about Bennett with her mural. For as much as I’m still skeptical that Daya was the right character to place in this position, the show has more or less charted a realistic path for the character, if not a particularly dynamic one. “Tied To The Traintracks” is the first episode this season that treats Daya’s story as a central one, and thus the first time the show has offered any type of argument for the choice to put Daya in this role. The episode uses both its flashback and a series of phone calls to pull together the entirety of Daya’s character arc, focused on her relationship with her mother and her complicated relationship with her own child and the circumstances of both its conception and its birth. It is Daya’s attempt at typing up loose ends, but also the show resolving an arc that was in retrospect a substantial part of earlier seasons even if it all but disappeared last year. I’m realizing that was my issue: when Daya picked up that gun, it was after a season where she had mostly been marginalized in the narrative, becoming a part of Aleida and Gloria’s stories instead, and the show never really did any of the work necessary to connect Daya’s choice to her previous experiences. And because of the pacing of the fifth season, that work has come slower than I might have wanted, meaning I spent a lot of hours wondering when the show would explain itself despite that expectation being unfair given how little time has actually passed. We get the explanation here, though, and it’s about what you’d expect. The flashback to a teenage Daya—played by Dasani Kristal Gonzalez, the latest triumph by the show’s casting department in finding uncannily similar-looking actors to play younger versions of our characters—reinforces Daya’s consistent struggle to live life in the way her mother recommended: she picked up the gun because it’s what she thought Aleida might have done, but Daya is never going to be a shark like her mother. She is always going to be a manatee, which is consistent with the character’s withdrawal from parts of prison life but still seems a bit too clean. The flashback also connects to Daya’s desire to ensure that her own daughter grows up with a better support system, as she contacts Delia and tells her that her baby is alive, and that she wants her to raise her. The lesson seems to be that Daya was never given space to figure out how to live life on her terms, which echoes her anxiety when she discovered she would be in prison with her mother: that’s a very specific dynamic, and one the show has developed better than it’s developed Daya’s character on an individual basis. With Aleida on the outside, it will be interesting to see what happens with Daya’s story from here, and whether or not the trial—or whatever might amount to a trial—plays out in the following seasons. The timing of Daya’s flashback is timed to the point in the story where she becomes a bargaining chip. Once a returning Figueroa—serving as the negotiator for the state—hears that someone was shot, it fundamentally does not matter who the shooter was: it could have been any inmate, and it would still be expected that they would be turned in. Judy King’s revelation on Meredith Vieria’s show with Aleida is another example of the complex dynamics as Litchfield interacts with the outside world: other than maybe Coates, there is no one else outside the prison who could have reasonably known about the shooting, and it’s possible that Coates didn’t even tell the authorities about it during his debrief. Judy King’s casual reveal of the details involved destroys whatever moral high ground that Taystee had managed to establish in their conversations. Using the internet, Taystee is well prepared with data on the struggles of the private prison system, and blasts through Fig’s “economic conditions” argument with a cheering section of her friends and Piper. But she can’t fight the stigmas that come with the violence, which pulls amnesty off the table and threatens the entire negotiations until Daya decides to sacrifice herself. And even then, how differently will the inmates be treated now that Judy King has given evidence to the initial efforts to dismiss them as violent savages uninterested in rehabilitation, despite having done her best to represent the inmates’ concerns during her interview? The most dynamic stories within the riot have been those where characters are faced with tough decisions to make. The central one here—whether or not the negotiating team should sacrifice Daya in the hopes of getting justice for Poussey—is clearly drawn, but we also see Maria reversing course in the hopes of avoiding having time added to her sentence, and Gloria reaching out to MCC to try to get furlough to see her son in the hospital, in addition to Daya’s own decision in the wake of the truth emerging. The show has always been interested in the conflict between the individual and the collective: the show’s flashbacks have often been used to articulate how the distinct experiences of one inmate reshape their relationship to their peers, but in those cases within the confines of a prison system that works to strip away individual freedoms. Now, with less restriction on those freedoms, we are seeing how certain characters will fight for their self-interest, and how the idea of a truly cohesive community like the one depicted at the beginning of the previous episode was always doomed to fail. The important thing, though, is to think about why this is. 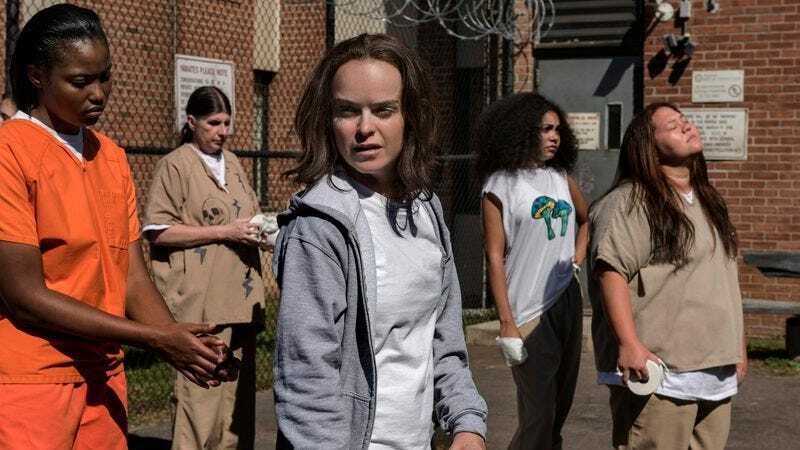 The outside world would argue it is because inmates are inherently bad people: Pennsatucky is experiencing the perils of mob justice, tortured by Leanne and Angie and the other white inmates in the wake of her choice to let Coates go free, and the outside world would say it’s because criminals will always be criminals. But the show as a whole has always argued that the system—and not the inmates’ inherent selves—is the root cause of the way inmates treat one another, and the lengths they will go when behind bars. Leanne and Angie might just be cruel idiots, but they might have been able to better understand the principles of community service if they had been given the opportunity to understand their time in prison through that lens. If they had been entered into a prison system focused on rehabilitation and education, would they have so clearly rejected that idea in punishing Pennsatucky? Would the Latina inmates have been so willing to destroy Suzanne’s “simulated prison” and handcuff her to a bed if they were being treated with empathy by the guards? And would Daya have been so adrift that she would pick up that gun if she had been given outlets for her art by the prison system? Would any of the drama that has unfolded in this show have happened if the prison system wasn’t so fundamentally broken? We don’t know the answer to that question, and it’s very likely that some violence or tragedy might have befallen Litchfield even if it wasn’t for the systematic failure we’ve seen unfold over the course of the series. But in searching for an answer to why it was Daya that picked up the gun, I now realize I could have stopped looking for something specific and just gone for the show’s global explanation for everything: in a system this broken, any inmate might have felt like they needed to make the same decision Daya did, even if she’s the one who has to deal with the most consequences from her action. Red’s time as comic relief seems to be coming to an end as Nicky finally clues in that Blanca has been giving her speed instead of “vitamins”—I’m flummoxed why they spent half a season (which is only like two days but still) on this, but glad she’s coming out of it, and we’re going to confront the Piscatella story outright (just as he enters Litchfield in riot gear, and not through the carefully planned route that Blanca Home Alone’d herself in). I was watching an episode of another show that chose to put a “Special Guest Star” credit after the end of the episode to avoid spoiling that character would be appearing, so I continue to be flabbergasted that this show doesn’t do the same. Once you see Steenburgen and Schreiber, you sort of know we’re going to be returning to Pornstache, which takes some of the suspense out of the piece. A lengthy musical montage reorients us to the state of things at the end of the episode: not much is going well, with the guards still hostages, Suzanne handcuffed in pain, and Gloria seemingly working to sell out her fellow inmates to be at her son’s side. Between the train metaphor Piper introduces here and the Trolley Problem in Unbreakable Kimmy Schmidt, big summer for pop philosophy on Netflix. “Riot Girls” is a cringe-worthy segment title, but “Litchfield of Dreams” doesn’t even make sense—c’mon now, Meredith. I totally get why Boo might not necessarily be willing to support Pennsatucky given her choice to continue seeing and protecting Coates, but Boo is way off base to be prioritizing hooking up with Linda over Pennsatucky’s basic safety—their friendship has been a strong part of the past few seasons, so I’m hoping we see some more development on this. I’ll be very curious to see how Daya’s situation unfolds: although Humps was clearly wounded by the gunshot, his vegetative state was Maureen’s doing, not Daya’s. He can’t speak for himself, so does the guy in the medical center become the chief witness? Lots to unpack, if the show chooses to do so next season.